MyAdmissionsEssay.com is one of writing essay companies which offers help for students in writing different kinds of academic papers. It suggests 5 types of services: essay, dissertation, homework help, admission, assistance in solving some particular problems and editing. All of these works are divided into 3 academic levels: undergraduate, bachelor and professional. 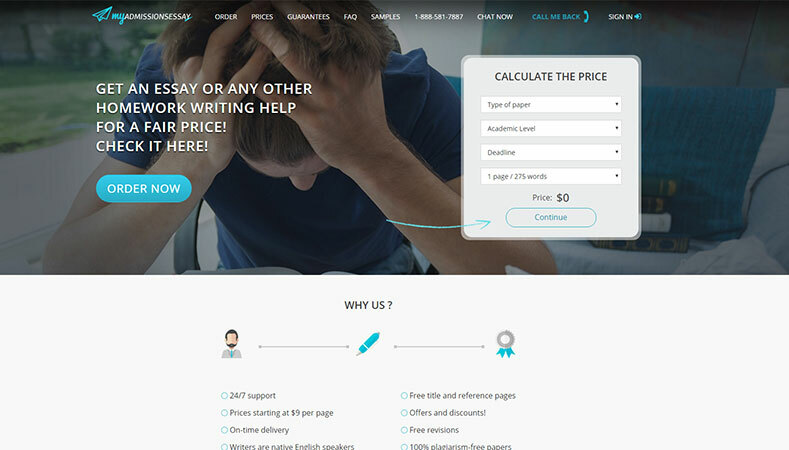 From the very beginning, as soon as you visit the site of the company, you will be able to calculate the price for your order by choosing appropriate type of paper, difficulty level, deadline and number of pages. By the way, there is noted approximately how many words are on pages; this is very comfortable for customers and eliminates the need to count it by yourself. The company guarantees that the writer will be a national speaker with a great experience. Customers even have got a possibility to choose if the author should be British or American, but notify that writers from certain country may be unavailable at some time. If you liked the paper your author had prepared and wants him/her to write another one again, you can ask for this. The massaging system is available in a personal account, so it is possible to inform the writer about something personally or ascertain if all the instructions are followed. The company cares about preserving customer privacy. Because of that any credit card information will not be stored as well as customers may not share personal information with the writer, and of course, the writer also will not do that. The service also provides the customers with money-back guarantee, but all the rules concerning it are limited and strict. Most of it depends on assignment of the writer; if he/she started the work, the money cannot be 100% refunded. On the site you will be able to find detailed information about this guarantee. MyAdmissionsEssay.com prepares plagiarism-free papers. Each work is checked with the tool WebCheck. One more guarantee is about meeting all the initial requirements. If you see that some of them are not met, you can demand to revise your paper for free. There is a page on the website with all the necessary information about revision. Despite of a special table on the home page of the site, you will find also another one on the page “prices”. It is very comfortable and there you can see pricing for all kinds of work. There all the customers can choose the currency they use and compare prices. Costs depend on academic level and deadline, so it would be better to make an order as soon as possible to pay less. One page of undergraduate level costs $9; it is average price among the services like this. But if you need an urgent work you will have to pay $31. The service also prepares presentation; one slide costs 50% of the price per page. Title and Reference pages are included in the paper automatically, so they are free. There some company work samples are posted, so, each customer is able to read them for free and decide if their quality is enough. MyAdmissionsEssay.com offers customer support services, which is available 24 hours a day and 7 days a week.